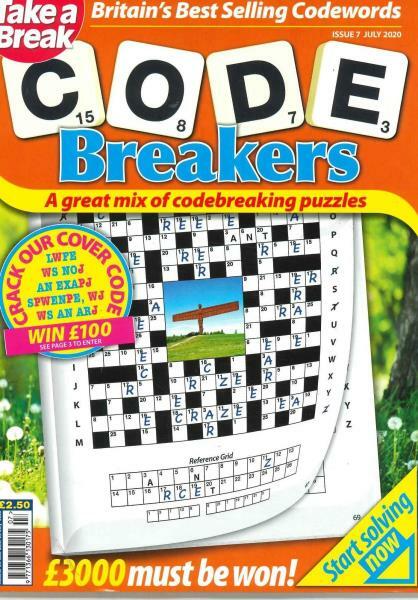 Take a Break Code Breaker is one of the puzzle magazines of Take a break. This magazine has friendly addictive puzzles in each and every letter in the form of a typical crossword grid that can be replaced by the number 1 to 26. You just need to give some time to different words and work out for them to crack the code and solve the puzzle entirely. This magazine has a huge collection of code base puzzles that will do brain teasing of young people. It will be a fun to solve these puzzles. This is one of the best code break magazine in the United Kingdom which is available in the largest format style. The readers can play different competitions online, sign up there for the subscription of the magazine campaigns in different cities and the players can share their online stories. The features of this magazine include different types of puzzles, crosswords, word search, Sudoku and arrow word. Solving these puzzles will increase your concentration and brain power. You can enter into different types of competitions launched by Take a Break Code Breaker Collection. The big value code breakers can also look out for the Code breakers Collection. It has around 85 coded crosswords that can be solved in a clear way by the players. These puzzles are easy to read puzzles and entertaining as in the main Code breakers magazine. Wish there were more cryptograms and more puzzles with a particular series of words in them, otherwise I love it.